The F-35B was a contract, given by the Marines, Navy, and Air Force to build a new, vertically landing, super sonic, Gen. 5 fighter (going to be using some terminology, just hang in there) to replace the old, slow AV-8B Harrier. This aircraft was the first, and only fixed-wing VTOL (Vertical TakeOff and Landing) aircraft in 1998, until a new aircraft was needed. This aircraft, with the contract given to Lockheed Martin, was the F-35B. The F-35 has new designs and avionics. In the cockpit, there is 1 big 20” x 8” LCD (Liquid Crystal Display) as part of the new improvements. This incorporates flight data, weapons tracking, fuel status, and the new, improved, AESA radar. The size of the jets have actually gotten smaller. For instance, when compared to the tried-and-tested Boeing F-15E, which many have seen, the length is 12.6’ shorter, with the F-35 being only 51.2’ in length. The height and wingspan are smaller, too. The F-35 is only 14.3’ high from wheels to tail, and 35’ on the wingspan, versus 18.5 height, 42.8’ wingspan on the F-15. The weapons load is also smaller, with the F-35 at 15,000lbs., the F-15 at more than 23,000lbs. of ordinance. For guns, the caliber has actually increased in the new planes. The F-35 uses a GAU-12/U 25mm gun, the F-15 a M61A1 20mm. 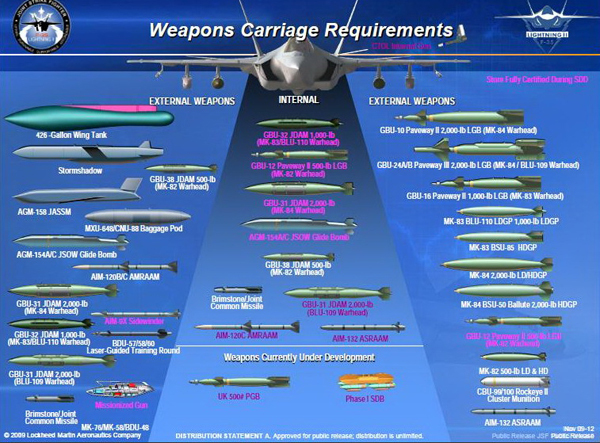 The standard internal weapons load for the F-35 is 2 AIM-120C AMRAAM’s (Advanced Medium Range Air-to-Air Missile), and 2 GBU-32 JDAM’s (Joint Direct Attack Munition). This is less, however, because the F-35 has to maintain stealth, which involves some interesting anti-stealth ideas. The F-35 uses many concepts to avoid being detected on radar. One of them is absorption. The F-35 has special coatings of paint that allow it to absorb the radar. See, radar stations send out radio signals that bounce off planes and come back to the receiver. The absorption takes away some of those rays by making the paint into a second receiver, thus preventing the waves from going back to the radar station. The stealth is also helped to be maintained by a design idea called planform alignment. Imagine the surfaces being angled so that it reflects the radar at a different angle, like the lenses in a camera or telescope. The F-35 also has a radar cross-section (how big it would appear on radar) of a small bald eagle. Now, on regular radar, you’re invisible. On a new technology called Short Wave Radar, you may have some trouble, but that won’t be around until 2025. That technology involves using a shorter wave of radar, and if you have the computing power to clean all the clutter, then your F-35 has a problem. The F-35 is the main focus of many groups right now, within NATO, the UN, and America’s Allies.